Listed today were lots of new framed prints, a couple of one off picture framing examples and some clearance sale items. It's still just $20 delivery for any number of framed prints shipped to one address. Although we offer picture framing for all prints in stock with a turnaround of just over a week plus shipping time we are adding to the selection of framed prints and stretched canvas prints that we have on hand ready for immediate shipping (or pickup from our Christchurch gallery) as we come up to the Xmas gift buying season. In the 1970s NZ Fine Prints owned a picture moulding factory here in Christchurch (it was the time when "vertical integration" was a popular business strategy - I'm surprised the previous generation didn't invest in a tree plantation to grow the frames). This changed during the 1980s when our focus on to the mail order rather than the retail gallery side of the business meant we gradually dropped the framing operations, the slack taken up by the excellent network of custom picture framers that we continue to deliver to throughout NZ. 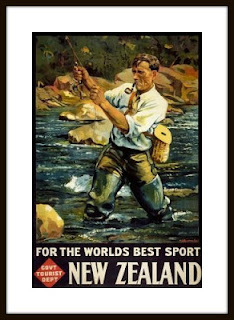 However we realised several years ago that offering basic framing saves our customers the time and hassle of getting a print framed once it is purchased but this writer was surprised to discover that NZ Fine Prints have been testing a picture framing service for over three years but it is only now that we are about to roll out a complete "ready to hang" state to browse prints.co.nz (apart from showing only prints that have a framing option this will also change all canvas prints to the stretched canvas versions that are ready to go on the wall, not delivered rolled in a mailing tube). It hasn't just been the Christchurch earthquakes, we had to spend a lot of time researching what kinds of frames print buyers actually wanted, and then source frames and picture framers whose work would last for decades (because our company's label will be on the back). 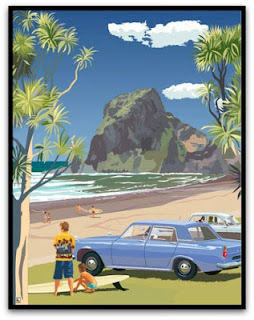 A couple of examples from today's arrivals include the first of the retro views of NZ available framed (Piha, 1969 by Contour Creative Studio) and one of the vintage travel posters in a standard black wooden frame, the fly-fishing poster "New Zealand: For the World's Best Sport" designed by Maurice Poulton.